Into the Woods presented by Fiasco Theatre is so innovative and well acted that I was immediately swept up in the action and transported to a fantasy world of witches, bakers, princesses & giants. From the moment you step into the Eisenhower Theater and see the fairy tale before your very eyes, you will know that you are in for a retelling than the original. Many of the actors play more than one role in the show making quick costume changes a must and challenging the actors to create several very different personas right before our eyes. Speaking of the performances, each of the actors brought something special to this production. Eleasha Gamble’s role as the Baker’s Wife paired perfectly with Evan Harrington’s Baker, with Gamble’s “Moments in the Woods” being a high point in the show for me. Harrington and Fred Rose (as the Mysterious Man) made the song “No More” really come alive by literally bringing the song down to the audience’s level. Vanessa Reseland makes the part as the Witch her own using only the shear strength of her acting. Laurie Veldheer was just as amazing as Cinderella. She has the girl-next-door charm that makes her immediately appealing & sympathetic. The parts of Jack and the Steward were both played by Philippe Arroyo and he did such a good job of differentiating between the two characters. Arroyo’s “Giants in the Sky” was perfectly sung and his relationship with his best friend Milky White is heartwarming. Lisa Helmi Johanson was perfect as sweet yet deceitful Little Red Riding Hood and as sweet and free as the girl the long golden flowing hair Rapunzel. One more piece of the show I must add to this review is the addition of the song, “Our Little World”, sung by both Johanson as Rapunzel and Reseland as the Witch. This beautiful song pulled at my heartstrings as the mother of a young lady and is the perfect set-up for the “Witch’s Lament” later in the second act of Into the Woods. I realize I am amazed over this production. I could sing many praises of this show but instead I encourage you to see it for yourself. 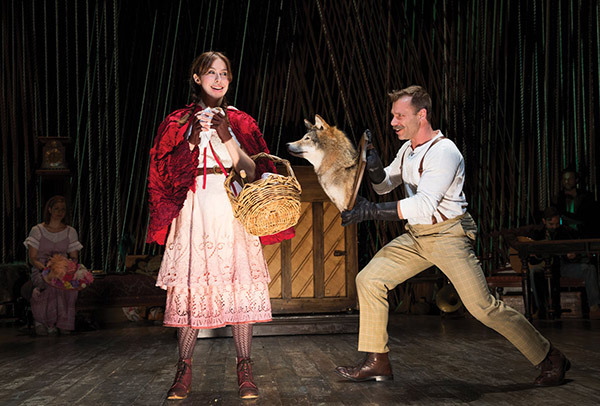 Make the trip to the Kennedy Center to see Fiasco Theater’s Production of Into the Woods. The play runs until January 8th. Running Time: Two hours 45 minutes, including a 20-minute intermission. Recommended Ages: 8 and up.